Right above my shop is a room where we have a pool table. I haven’t done much with this space other than fill it up with a few things we found on Craigslist when we first purchased the house, one of those items being a pool table lamp. 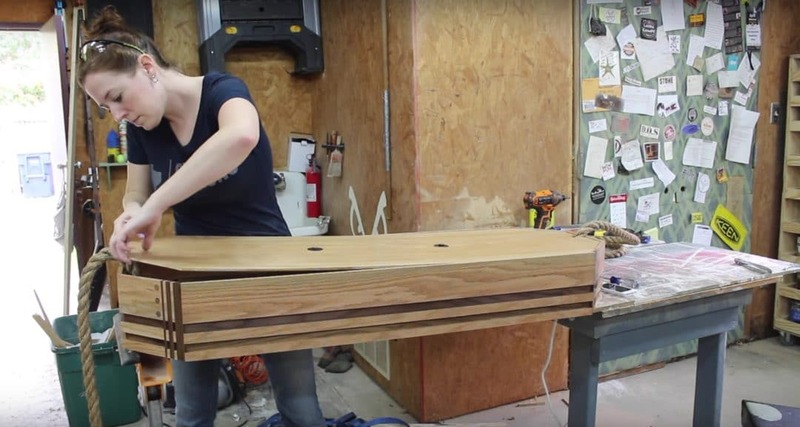 I’ve always hated this lamp and now that I’m into building things I figured I would try my hand at making my own custom pool table lamp! Now I typically have a rustic style with my projects but for this space I want things to be a little more…sophisticated I guess. It’s mostly my husband’s man cave so I certainly don’t want to take away from that. I played around in SketchUp a little bit trying to work out a design, but I quickly realized that this was going to be one of those projects where I just had to jump in and start playing around. Here is a photo of the finished lamp so you can follow along with the tutorial below and know where it’s all going. Keep in mind if you are wanting to replicate this project that you can use the same methods or concepts that I used but customize the lamp further to your personal likes and dislikes. I have a set of step by step plans available if you want to build your own billiards light. 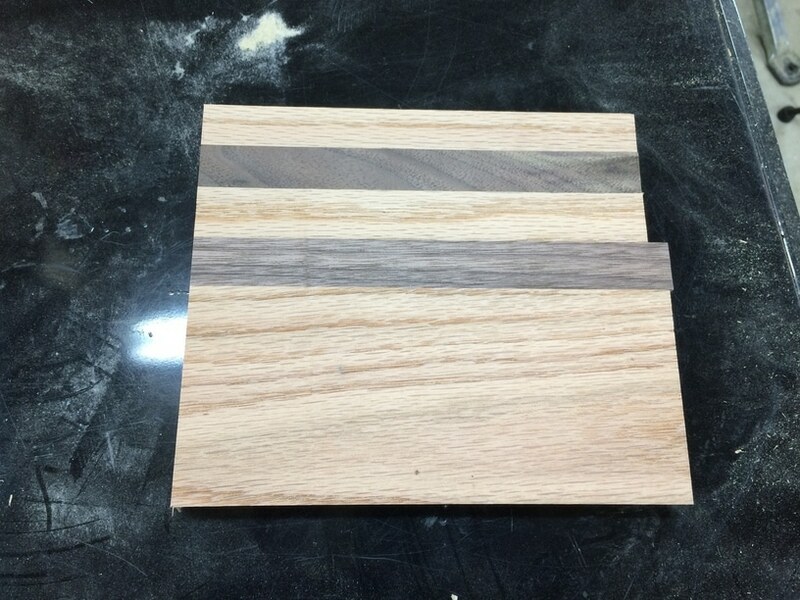 [/one_third_last]A few years ago a buddy gave me a bundle of walnut and I’ve been hanging on to it, well I finally broke into the bundle to use a little on this project. 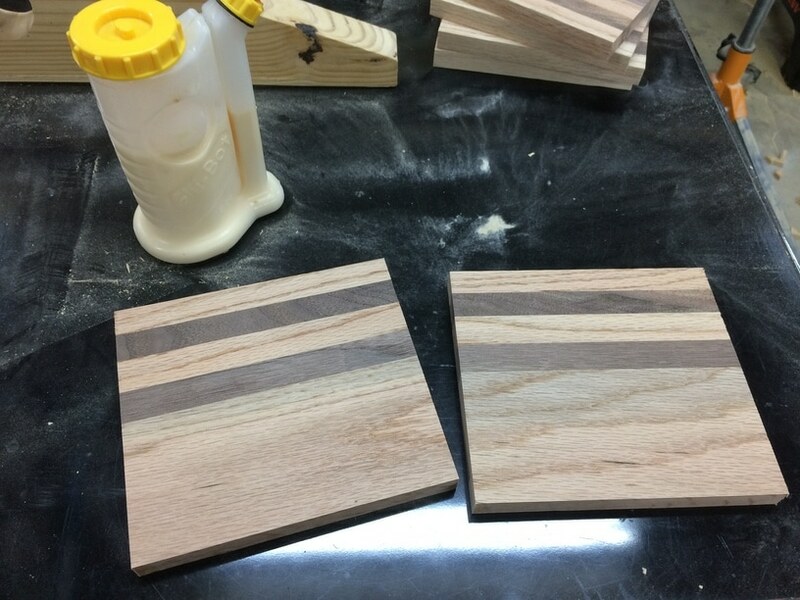 For a contrasting wood I went with oak and these boards I purchased from the big box store. 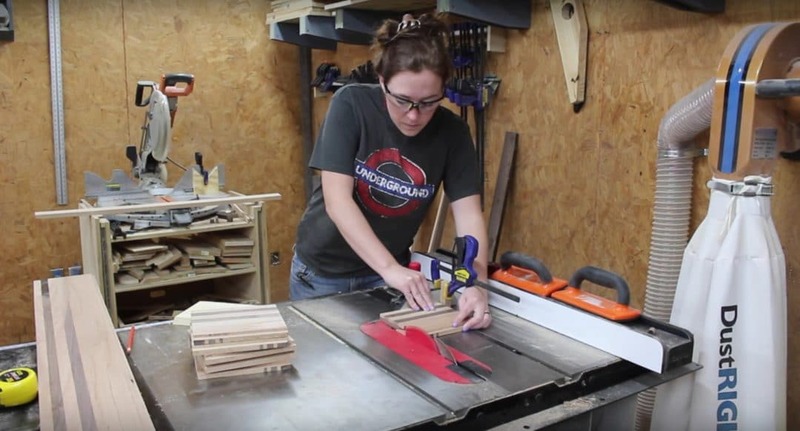 The first thing I did was use my miter saw to cut the boards down to rough size. I left these about 1/2″ longer then what I knew I wanted them to be so that I would have room to cut everything down to square later. 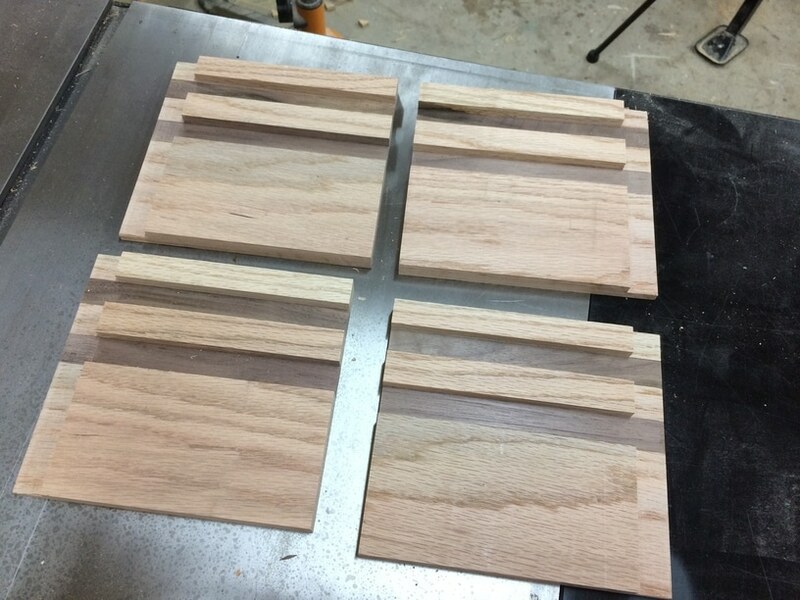 Next I ran the boards through my table saw to cut the pieces to the exact width. I’m going for a long octagon shape so I’lll have six short panels and two long ones. However, all of the panels consist of the same pattern and are made the same with one larger piece on top then four thinner strips under it. 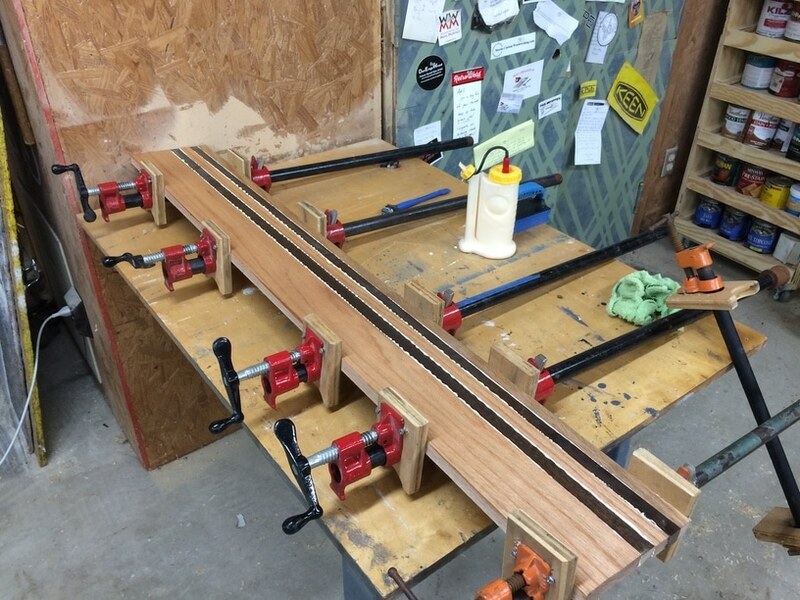 After cutting all the strips I glued then clamped the panels together, letting them dry over night. Note: I used a damp cloth to remove the majority of the glue squeeze out. 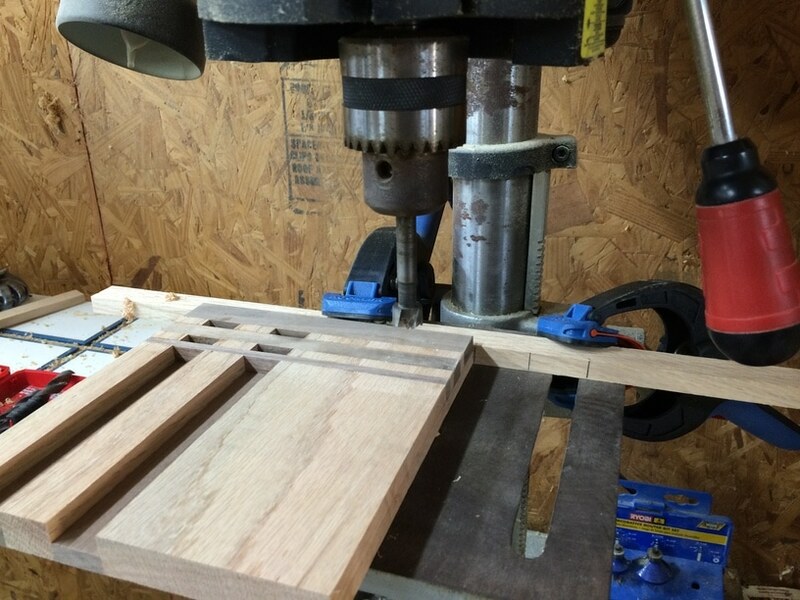 Once the panels were dry I ran each board through my thickness planer. I wanted all the boards to be flush with each other but I also wanted to remove some of the weight since this is a light fixture. Next I cut all my panels to be square. 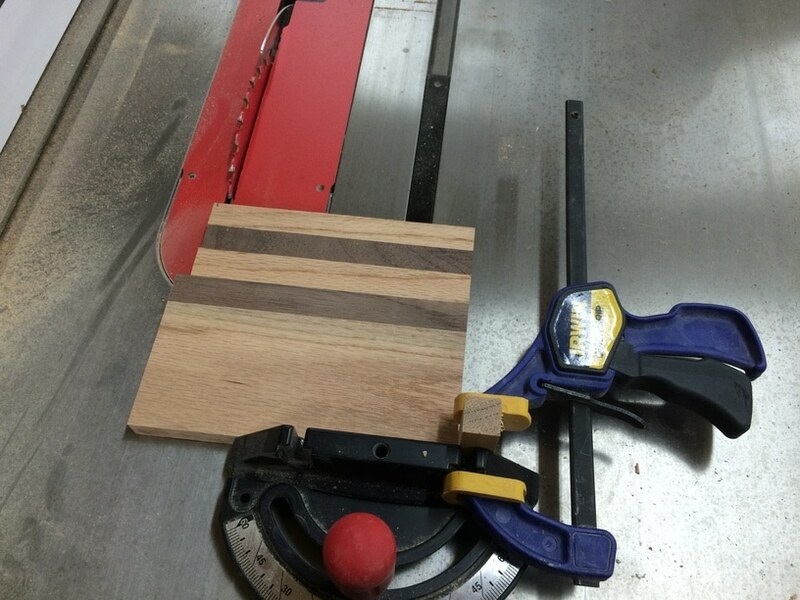 Since I haven’t yet built a miter saw sled I used my miter gauge with a stop block clamped on to it. I ran each panel through once then adjusted the stop block and ran them through again to cut the other side square. Ok next was an experiment but I’m really happy with the results! 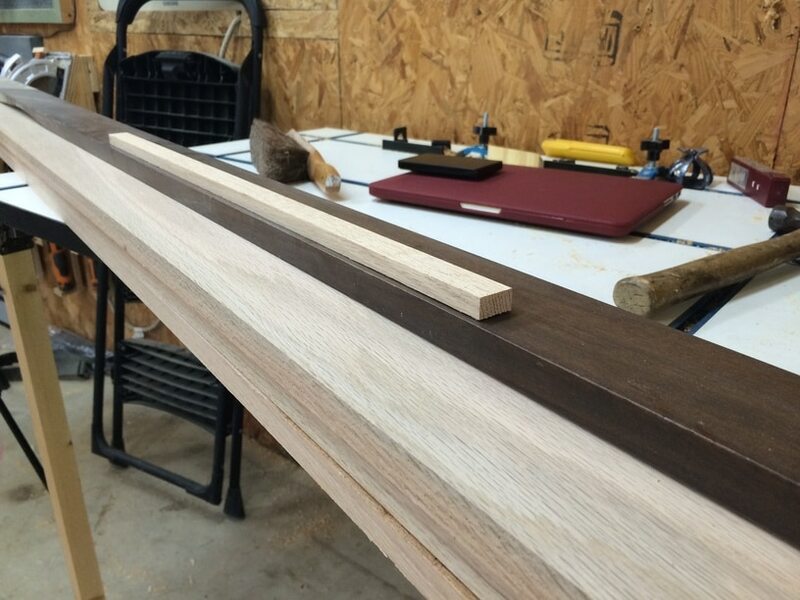 I wanted the walnut inlays to be recessed back from the oak and I thought it would be easier to glue everything together at the same thickness and cut away the walnut material (instead of first cutting thin strips and trying to glue them to the thicker oak strips). To do this I exchanged my regular blade for my dado stack and ran each board through so that the walnut was cut back to around 1/4″. 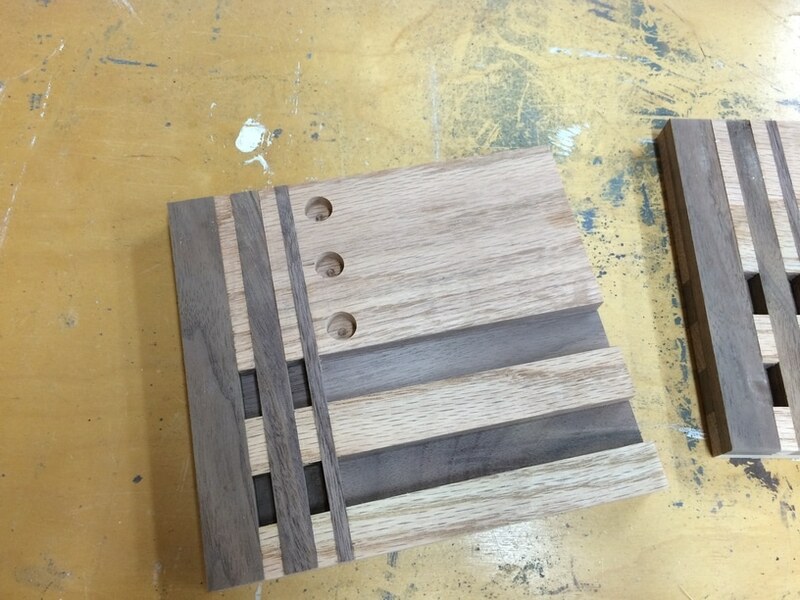 Take your time on getting not only the dado stack thickness correct but also the placement of it. 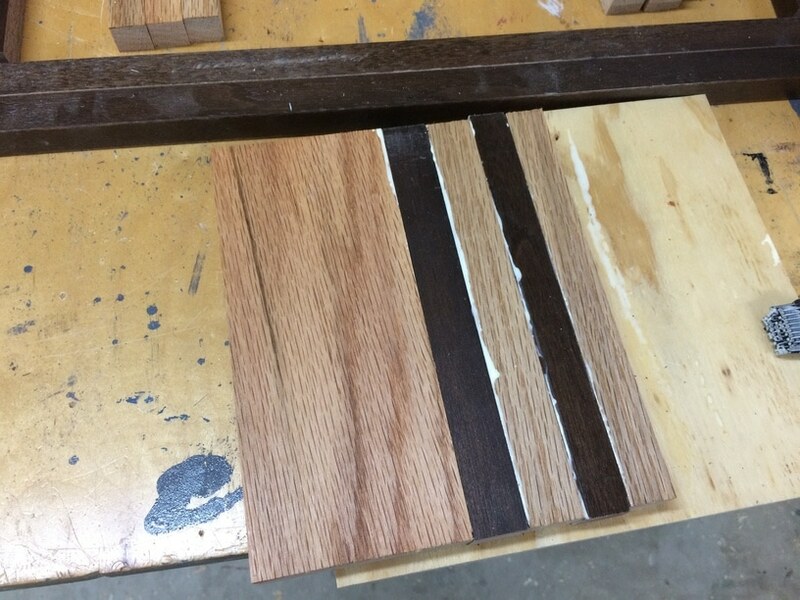 After cutting all the horizontal walnut inlays down, I decided to add three vertical strips to two panels on each end of the lamp (so four panels total), I also decided to make them all different widths. I started with the first one and ran all four panels through. Then I reduced the size of my dado stack and ran them though again. I repeated to make a third and final pass. 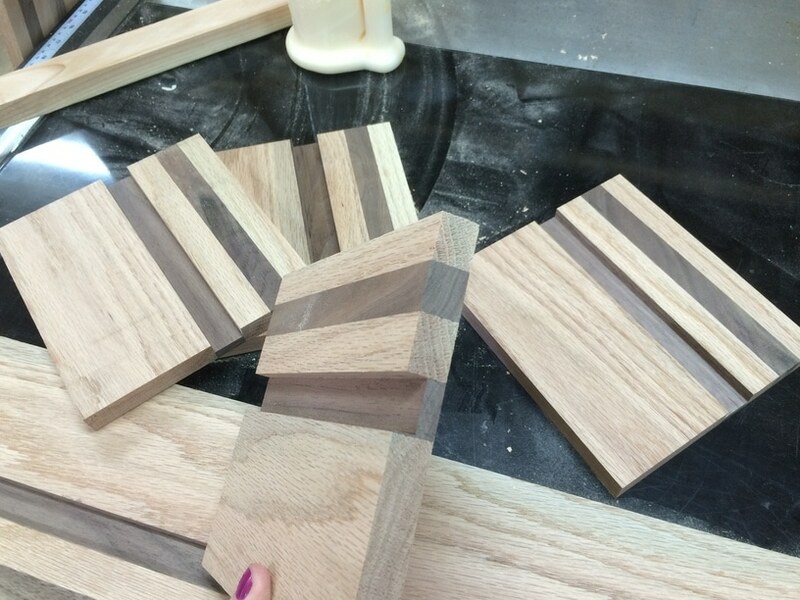 To fill in these cuts I just made I grabbed some walnut scraps and cut them to size of the three different cuts. 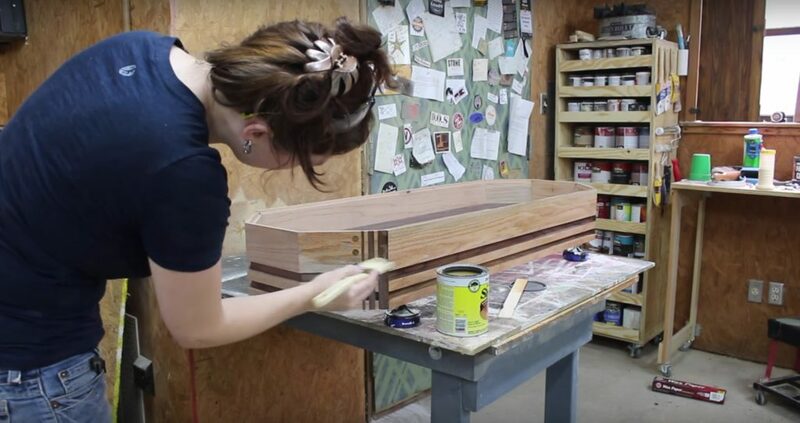 Take your time on making these so that they fit nice and snug in their slots. Once I had them down to the right width I used the thickness planer to knock off some height and make them flush with the panels. 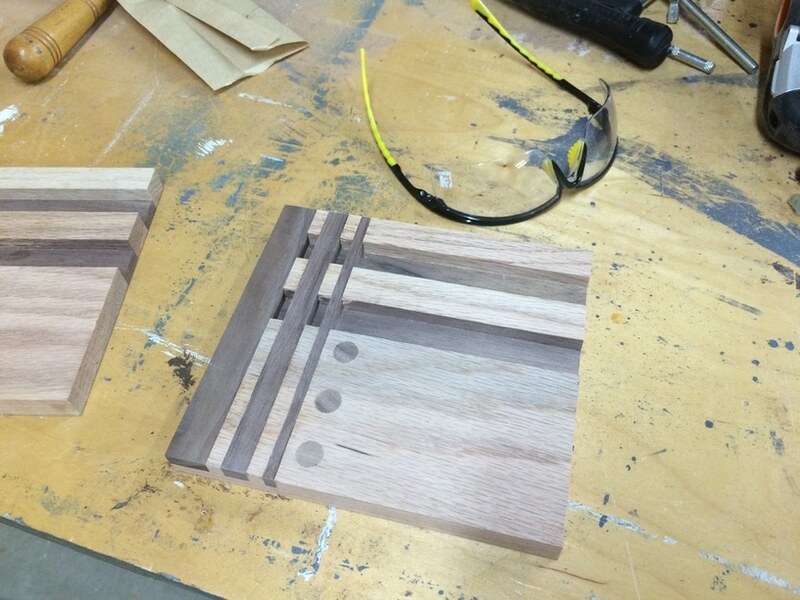 Note: I taped the two smaller sizes together so that they could safety go through the planer. Also, while I was cutting in dados I cut a rabbet on the backside of each panel where a top will later go. Next I glued and clamped these in place to dry. Again, using a damp cloth to get the majority of the glue squeeze out from the surface. Since these strips create closed off portions I used a damp Q-tip to get in these spaces and get the glue. 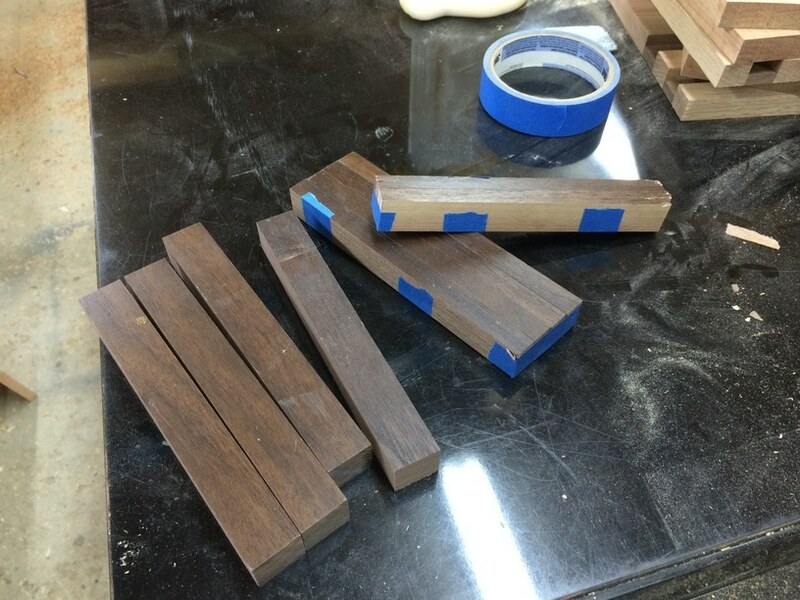 After letting it sit over night I knocked these accent pieces down flush by clamping my belt sander to my workbench and working the piece until both sides were smooth. At this point I decided to add more accents to these pieces by using some plug bits. 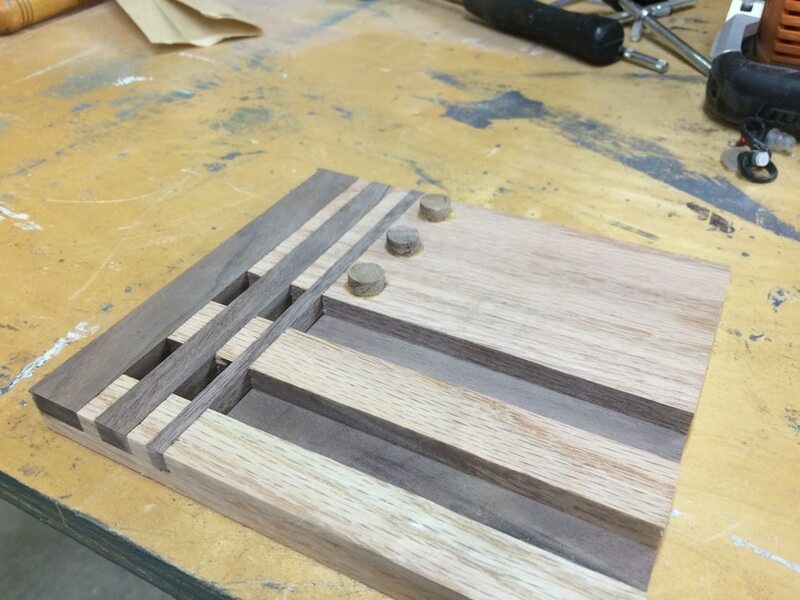 I would first drill three holes with a forstner bit then cut some plugs the same size from the walnut. I glued, hammered, and let these sit until dry. Next I used a pull saw to cut them down flush with the panel. I was actually planning on adding some accents to the longer panels as well but when I got here I thought it would look better to leave it as is. But! if you are making one then maybe play around with different ideas that you’ll like. With all the panels made I moved on to cutting the edges to join them together. Again, since I don’t have a sled for my table saw I ended up using my miter gauge with a stop block clamped in place. I positioned the smaller panels so that only the edges were being cut. For the long panels I screwed a temporary fence to my miter gauge. If you do the same make sure the board is straight and sturdy so the panel will stay square as you push it through the blade. 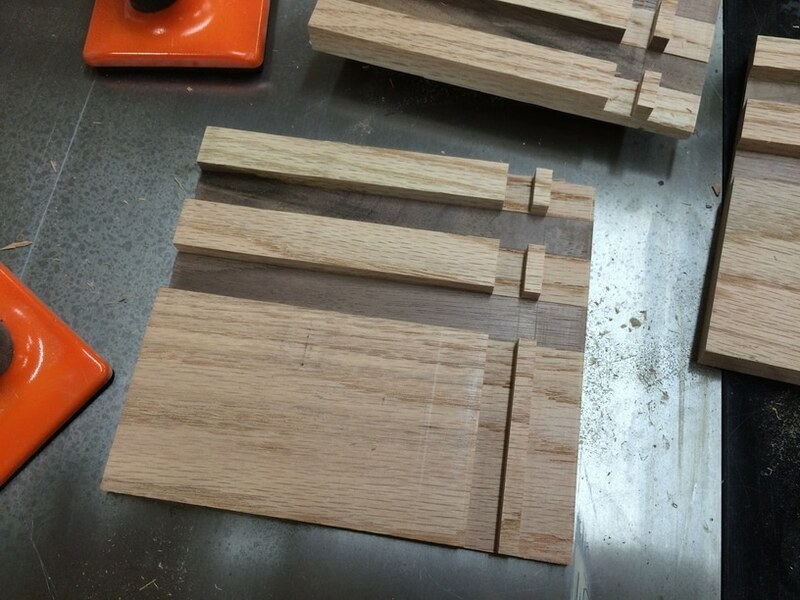 I used a biscuit jointer to reinforce these mitered cuts. 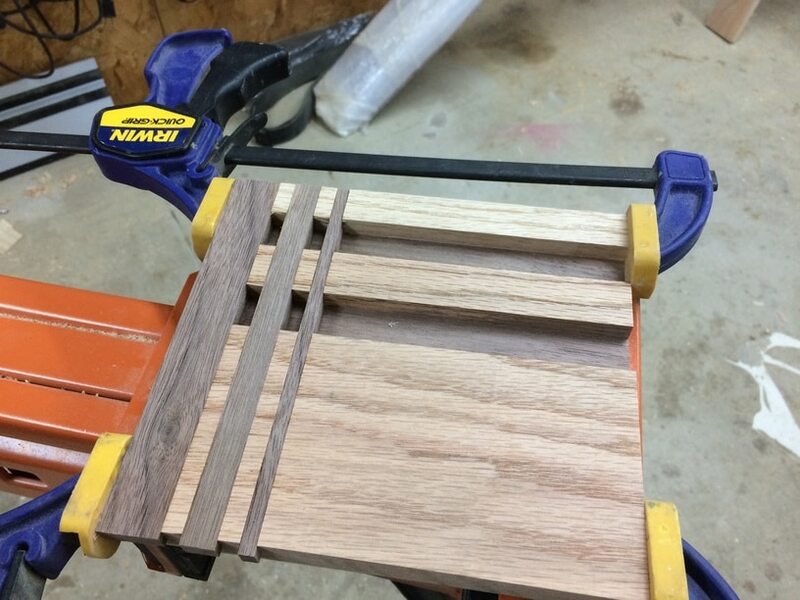 I was only able to place one biscuit on the panels since the bottom has those recessed walnut strips, but this is plenty to make these joints strong and durable. After cutting all the biscuit slots I glued and clamped the lamp together to sit overnight. Note: I used two ratchet straps to compress all the joints at the same time. I also placed wax paper behind the straps because I was afraid they would bond with the glue. Before calling it done for the day I used a damp cloth to go through and clean up as much glue squeeze out as possible. This will cut down on a lot of work in the next step. I let it dry over night then took the clamps and wax paper off. Next I took my time sanding each side, paying special attention to remove all dried glue. 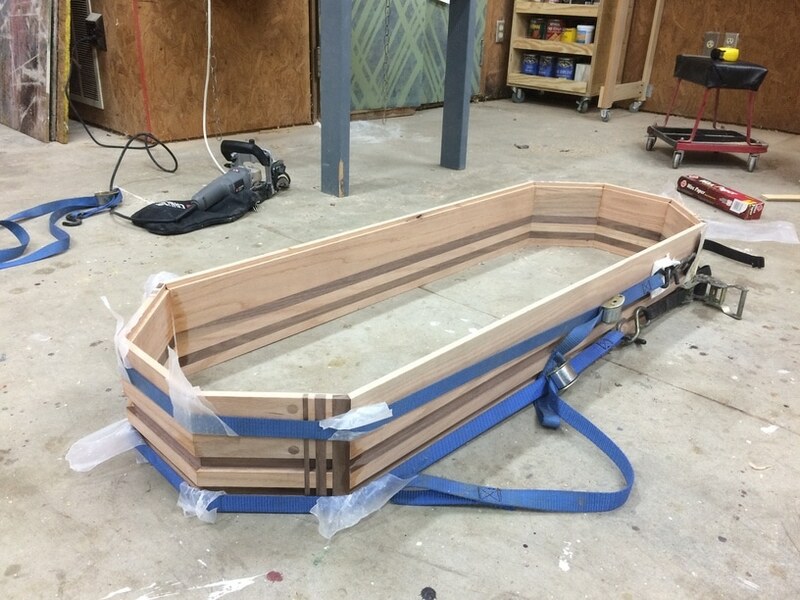 With the body done I grabbed some 1/4″ plywood and laid it down on my shop floor. I flipped the body over and used a pencil to trace inside the rabbet I cut earlier then used a jigsaw to cut it out. This will give me my cap piece for the lamp. For a finish I applied three coats of Shellac. I would apply a thin coat then let it dry for about 30 mins then come back and sand with 220 grit paper before applying the next coat. Once things were dry I attached some mounting hardware to the inside end panels. I purchased these from the big box store as well as some help rope to hang the lamp by. 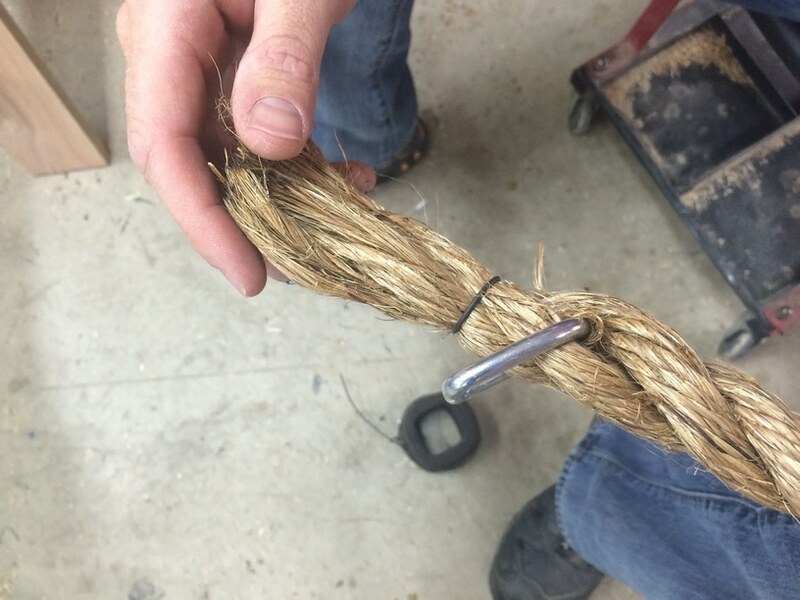 I threaded the hardware loop onto the rope before attaching it to the lamp body then used baling wire to keep the end of the rope from unraveling. I reused the lamp from the previous light and just secured it to the cap using some long screws, flat washers, and nuts. I cut two holes in the cap just big enough for the ropes to fit through then used some more hooks from the previous steps to hang it from the ceiling. Since I only had to purchase the oak, rope, and hooks for this project it actually turned out to be pretty cheap! I spent around $80 total. However, if you also had to buy the walnut and lamp fixture inside then it would be more then that.